Series #55 are heavy duty cold forged casters with a zinc plated top plate and yoke. They use a large diameter double ball bearing raceway swivel head, and 3/8" thick double welded legs. Components are heat treated for wear resistance and added strength. Swivel locks, grease seals, sealed bearings, brakes, and bearing options are available. For ordering or additional information, please call 1-888-904-9531. 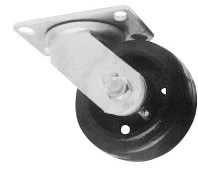 Uses for Series #55 casters include heavy duty platform trucks, welding table, drawn equipment, tow line carts, steel handling carts, and any heavy duty industrial applications where high capacities are required. Bolt Hole Pattern: 2-7/16"x4-15/16" slotted to 3-3/8"x5-1/4"
5" 2-1/2 Semi Steel 1500 6-1/2 NCC-55S525-SSR 14 NCC-55R525-SSR 12 "
Ductile Steel 1800 NCC-55S525-DSR 16.8 NCC-55R525-DSR 14.5 "
12" 2-1/2 EZ Rolling Polyurethane on Steel 1800 13-1/2 NCC-55S1225-EZPUR 25 NCC-55R1225-EZPUR 23.5 "
Semi Steel 1800 NCC-55S1225-SSR 24 NCC-55R1225-SSR 22.5 "
Phenolic 1800 NCC-55S1225-PHR 18 NCC-55R1225-PHR 16.5 "